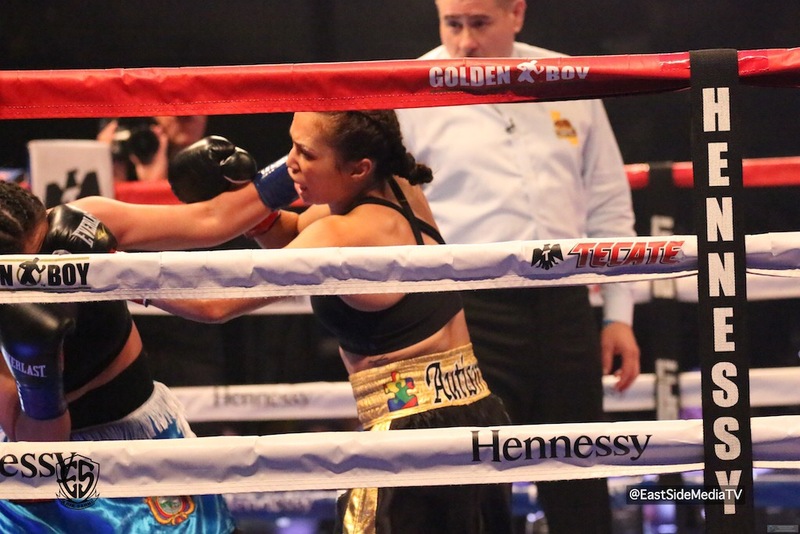 Seniesa “Super Bad” Estrada (14-0, 4 KOs) of East Los Angeles, Calif. shined with a third-round technical knockout victory against Jhosep Vizcaino (6-7, 3 KOs) of Quito, Ecuador in the scheduled eight-round co-main event in the flyweight division. Estrada dominated Vizcaino with superior speed and skill, forcing the fight to end at :20 of the third-round. “I had a great camp. I worked on sharpening and shortening up my punches,” said Seniesa Estrada.”As you can see, the hard work in camp paid off. I’m getting more comfortable in the ring because I’m now with a promoter. Golden Boy Promotions is keeping me busy, so I’m fighting more consistently. Having me stay busy is the most dangerous thing for my opponents. Seniesa “Super Bad” Estrada (14-0, 4 KOs) of East Los Angeles, Calif. went against Jhosep Vizcaino (6-7, 3 KOs) of Quito, Ecuador in the scheduled eight-round co-main event in the flyweight division.